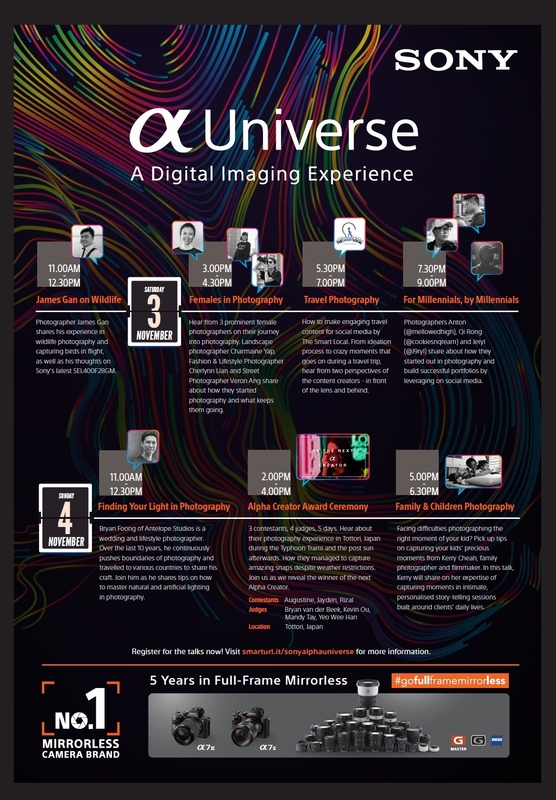 (SINGAPORE, 19 October 2018) – Celebrating five years of full frame mirrorless technology and being the number one[i] mirrorless camera brand in Singapore for the fourth consecutive year, Sony will host its first ever Digital Imaging Carnival at the Plaza Singapura Atrium from 30 October to 4 November, 2018. 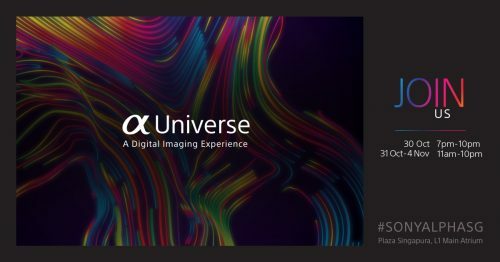 Titled Sony Alpha Universe, visitors will be able to learn more about mirrorless camera technology in an interactive setting and how it is revolutionising the photography industry. The event will also feature an incredible lineup of immersive installations, exciting activities and contests. A highlight of the event is the Sony Mirrorless Legacy Walk, where photography enthusiasts can uncover Sony’s illustrious history of mirrorless technology and innovations over the past decade. Visitors can learn and experience first-hand the superior technology of mirrorless cameras by exploring the various experiential installations. This includes taking a dive into a ball pit at the Different Sensors Sizes Explained installation or testing the low-light capabilities of mirrorless cameras by snapping a picture at the futuristic Full Frame Performance in Lowlight playroom. Sony’s full range of mirrorless camera and lenses will also be on display at the Sony Equipment Showcase. Aspiring photographers can pick up tricks of the trade from a series of professional photography workshops and engaging sharing sessions including photography lightning and photography in the social media age. 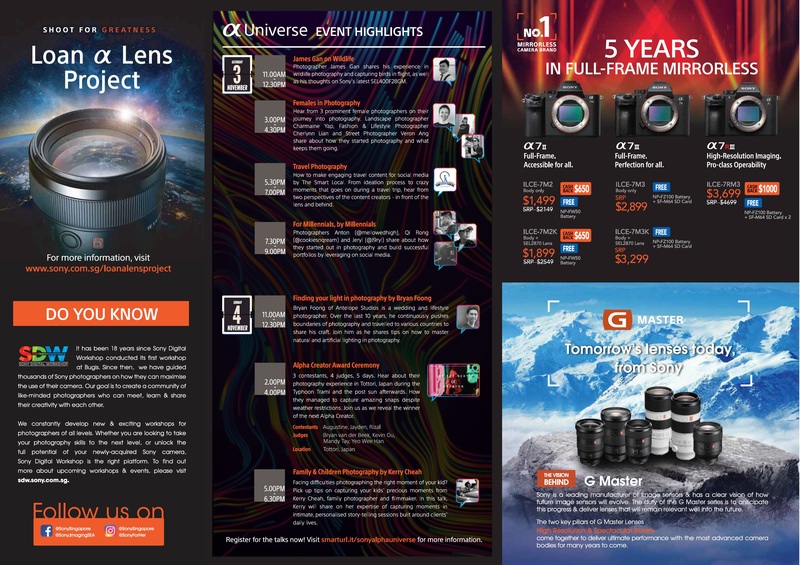 To celebrate the event, Sony will also be partnering with 10 social media personalities to run a give-away contest where one lucky winner will walk away with a brand-new Sony α7 II camera kit worth S$2,549.00. To stand a chance, participants will need to visit the Sony Alpha Universe pop-up, and publish a creative photo and caption on Instagram which best depicts and brings to life their experience at the roadshow. The post must contain the #SonyAlphaSG hashtag, @sonysingapore handle, as well as the Instagram handle of one of the 10 social media personalities. Besides the grand prize of the Sony α7 II camera kit, 50 goodie bags containing exclusive Sony merchandise will also to be given away as part of the contest. Contestants can keep a lookout for more details and track the competition via the #SonyAlphaSG @sonysingapore campaign hashtag and handles. Photographer James Gan shares his experience on how to hone patience for shooting birds in flight and his thoughts on Sony’s latest SEL400F28GM lens. Landscape photographer Charmaine Yap, Fashion Photographer Cherlynn Lian and Street Photographer Veron Ang shares about how they started photography and what keeps them going. There will be an open panel discussion at the end of the workshop. Learn about what goes on behing the scenes of TheSmartLocal, a leading independent local media publisher known for creating engaging social media content that reaches over 3 million Singaporeans each month. From ideation process to crazy moments that goes on during a travel trip, hear from two perspectives of the content creators – in front of the lens and behind. Photographers Anton Lim (@mellowedhigh), Hoong Qi Roong (@cookiesnqream) and Jeryl (@J9ryl) shares how they pioneered and built successful portfolio careers by leveraging on social media. Bryan Foong of Antelope Studios is a wedding and lifestyle photographer. Over the last 10 years, he continuously pushes boundaries of photography and travelled to various countries to share his craft. Join him as he shares tips on how to master natural and artificial lighting in photography. 3 contestants, 4 judges, 5 days. Hear all about their photography experience in Tottori, Japan during the Typhoon Trami and how they managed to capture amazing snaps despite weather restrictions. Join us as we reveal the winner of the next Alpha Creator. Facing difficulties photographing the right moment of your kid? Pick up tips on capturing your kids’ precious moments from Kerry Cheah, family photographer and filmmaker. In this talk, Kerry will share on her expertise of capturing moments in intimate, personalised story-telling sessions built around clients’ daily lives. [i] According to a leading market research agency.